Two young black men were shot by a white police officer on May 21. We know events like this happen. But here? In Olympia? Yes, here at home. This event brought forth a myriad of emotions and reactions from all of us. On Saturday night, people took to the streets of Olympia for a variety of reasons, including protesting racial inequality and police brutality, showing support for the police, and for reasons that are less clear. The result was an emotional melee of people with chaos, property destruction and personal injuries. While our viewpoints vary greatly, the vast majority of us agree that we do not want our city to devolve into violence, hate and bigotry. We need to take ownership of our community. We must look directly at the issues of race and address their impacts head-on in constructive, inclusive ways, because race matters. It is not about choosing sides in the controversy over the shooting. We must engage together because that controversy has created a heated environment ripe with opportunity for hate and hate-supportive groups to tear us apart. We, as a community, can do better than we did last Saturday night. We must face hard questions and our own deeply held beliefs, and be open to exploring in realms that feel scary and foreign to us. Our community must openly, inclusively and effectively address the systems, structures and cultures that drive disparate treatment and disproportionate outcomes for people of color — not just African-Americans — in our community. 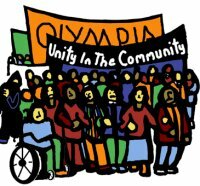 Unity in the Community is an Olympia-based coalition dedicated to organizing positive and pro-diversity educational events and appropriate community responses to the presence of hate groups in the Olympia area. Unity seeks to build working relationships with a broad range of ethnic and cultural organizations, faith groups, progressive organizations, government entities and individuals who support diversity as an essential basis for a strong community. Today, we call upon our civic and business leaders, our students and educational institutions, members of our communities of color and other marginalized communities, allies and neighbors, to begin a true, authentic and difficult set of conversations. Everyone needs to be able to speak his/her heart and mind in a safe environment; everyone needs to be heard. To this end, Unity proposes facilitating and supporting community conversations in diverse environments — faith communities, schools, civic clubs, public facilities and more. We call on diverse members of the community to talk with — not at — each other, to listen and to change for the better. For Unity in the Community, we are Jim Bamberger, Reiko Callner, Alec and Gabi Clayton, Nancy Eastham, Kathy Baros Friedt, Barb Gross, and Hisami Yoshida.